Read these instructions completely before attempting an installation. This document provides specific instructions on how to install HelpSystems Esend using the HelpSystems Product Loader. For general information about the HelpSystems Product Loader, see Using the HelpSystems Product Loader on our website. 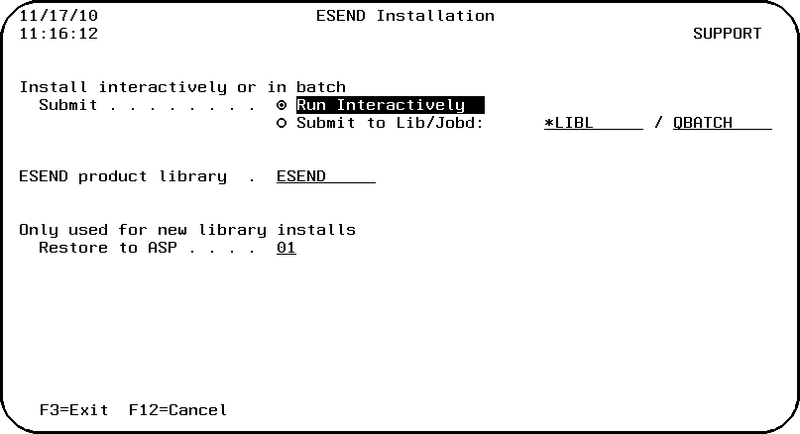 The installation process automatically installs Esend into the default library ESEND on the IBM i. Once the installation process completes, read the After You Are Done section for additional information. Your operating system level must be at i5/OS 7.2 or higher. IBM HTTPSVR i5/OS should be installed. Use the Display Software Resources (DSPSFWRSC) command to verify 5770DG1 is installed for V7R2. Review the ReadMe document for changes that may affect your environment. This document is part of the Instruction Package available on the Esend download page. You do not need to install Esend if you also are installing Sequel or Abstract. These products automatically install Esend as part of their installation process. If you are updating from Esend 3.7.233 or higher, the installation program keeps your existing authorization code. If you are doing a new install, or your current version is less than 3.7.233, you need a new authorization code from HelpSystems. Use these instructions to install HelpSystems Esend. This process downloads everything to your PC and loads the objects on the IBM i. Read the following steps carefully to proceed. Download the HelpSystems Esend installer (setupEsend.exe) from Your Account page on our website. Double-click it to start it. On the Choose Components panel, select which components you want to install. You can choose to install the Manuals and/or the Software for IBM i. Click Start to continue. The installer will extract files to your PC and launch the Esend Product Loader in a secondary window. Note: If you select the Manuals component, they will be installed in the following location. Select or enter the IBM i where you want to load Esend. Enter a user profile and password that is a member of the user class *SECOFR and has at least the following special authorities: *ALLOBJ, *SECADM, *JOBCTL, and *IOSYSCFG. The user profile should have Limit capabilities set to *NO. This profile will be used to restore and copy objects, and for product maintenance on the IBM i.
Click Immediate Load to load the product on the IBM i now. Click Staged Load to transfer the objects now and load them on the IBM i at a later time. Note: If you plan to override any install defaults, you must use Staged Load to ensure proper configuration. See "Loading Staged Objects on the IBM i" below for instructions on how to load the staged objects on your selected IBM i system. If this is the only installation of Esend you are performing, click Finish. If you have more installations on other IBM i systems, click Restart. Then, return to step 3. Note: If the Product Load Progress panel ends with an overall Failed message, the product upload could not complete properly. To find the reason the upload or install failed, click View Logs and review your logs. You can also use Download at the top of the logs to save the information for future review. If you chose to stage your objects using step 4b of the installation or update process, do the following to manually load them on the IBM i you identified above. Option 2 does not apply to Esend as a pre-check is not required. Option 4 to delete the save file associated with the product. After a series of status messages, the Esend Installation panel displays. This install panel is used for both first time installation or updating your existing version. Submits the install as a batch job. Enter the library and job description to run the install in batch. Enter the name of the library where you want to install Esend. Enter the auxiliary storage pool number for new installs of Esend..
Additional files are installed in the folders \sequel, \esend, \helpsystems and \rio. Note: You can move the library HSLOADMGR to a different system on the IBM i and use it to complete additional installs or updates. For more information, see Using the HelpSystems Product Loader on our website. For complete information on using Esend, see the Esend User Guide. If you want to install or update the optional iSeries Access plug-in, see the next step—Install the ESEND Plugin for System i Navigator. Otherwise, you are finished with your installation of Esend. Do the following for systems using System i Navigator V6R1. This process loads the ABSTRACT plug-in on your PC. From your PC select Start\Programs\IBM System i Access for Windows\System i Navigator. From the System i Navigator menu select View\Task Pad. Select the Install Plug-in option listed in the Environment tasks section of the Task Pad. Select Esend from the list of available plug-ins and follow the remaining step to complete the installation. Start iSeries/Operations Navigator and select the system where the Esend plug-in was installed. The Navigator should prompt you to scan for newly installed plug-ins. After the scan, you should see the Esend folder beneath your system connection. You can also access ESEND from the Navigator by opening the Basic Operations/Printer Output folder in the Navigator. Right-click a spooled file; you should see the Send Email option at the bottom of the options window. Note: See the previous section if you are installing the Esend plug-in for the first time. The following information is specific to current Esend users who are upgrading their software. If you already have the Esend client software installed on your PC, start System i Navigator to update your plug-in. Select the Upgrade or Service plug-ins option listed in the Environment tasks section of the Task Pad. Select Esend from the list of available plug-ins and follow the remaining step to complete the installation. Press Finish. Increase your command of Esend with Sequel.